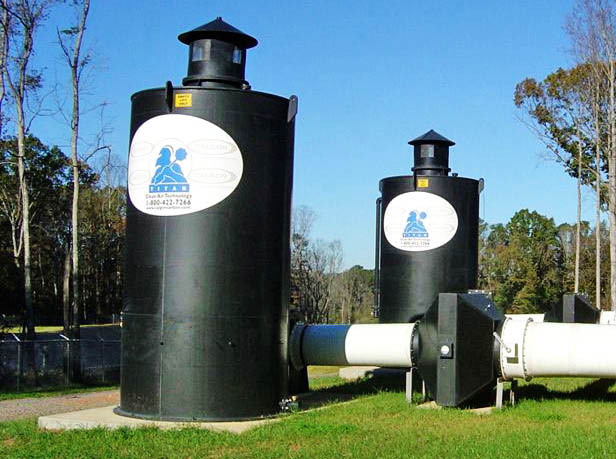 TITAN® odor control system is a cost-effective alternative to conventional activated carbon adsorber designs. TITAN® uses carbon in a radial flow system that is significantly smaller and less expensive than traditional deep bed adsorber designs.TITAN®’s revolutionary airflow design allows the system to process odorous air at a much faster velocity than ordinary deep bed systems. TITAN®‘s design allows it to be one-half to two-thirds the footprint of an equivalent deep bed system. The largest standard deep bed vessel (the 12’ diameter dual bed) has a maximum air flow capacity of only 17,000 cfm, while the largest single TITAN® vessel (the T110), not only has a smaller footprint but can also treat 30,000 cfm, nearly double the amount of air as the older deep bed design! While there are other radial flow odor control systems in the market, the TITAN® design has been scrutinized so that you can be sure you are getting the performance you desire. The TITAN® was designed using Computational Fluid Dynamics (CFD) to ensure that even air flow distribution can be achieved through the annular carbon bed. CFD results were validated by tracer study tests. 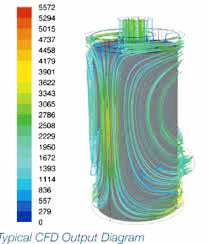 The isometric view below shows the flow streamlines through the vessel. The color chart can be used to determine the velocity (ft./min.) of the streamlines. The CFD model shows that streamlines are evenly distributed, which indicates uniform flow distribution hence uniform carbon use. CFD calculations also provide the design parameters which ensure proper contact time. TITAN® is ideally suited for municipal wastewater odor control applications such as pump stations and lift stations as well as wastewater treatment plant processes such as headworks, sludge thickeners, and belt press rooms. When filled with patented CENTAUR® HSV water regenerable catalytic activated carbon, TITAN® is effective against moderate levels of hydrogen sulfide (H2S) as well as odorous organic compounds such as methyl mercaptans and dimethyl disulfide. For applications that do not involve H2S, TITAN® can be filled with one of our other activated carbons. TITAN® is available in four models, T55, T70, T90 and T110, which can be provided in a variety of heights for ultimate flexibility. With multiple odor control technologies, Continental Carbon Group is uniquely capable of integrating two or more technologies to solve any odor control problem. For example, TITAN® can be used to polish a PHOENIX® system for the removal of odorous organic compounds at efficiencies greater than 99%.